Whats the largest troubleshooting focus at your plant? At our plant, the biggest source of quality defects in the painted part is mold-related. Plastic is painted for a variety of reasons, including aesthetics, for UV protection and to hide manufacturing defects. There are times paint can successfully cover or hide a mold defect, but there also are times paint can actually magnify a defect that may be difficult or not as obvious to see in the raw state. The types of defects we see will vary by the resin type, the molding method and which company is doing the molding. 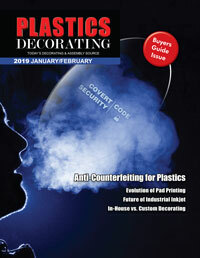 On SMC, FRP and DCPD resins, we run into pin holing (or outgassing), blisters and spider cracks. On injection molded parts, the biggest problems are splay, flash, knit lines and gouges. Our quality software enables us to provide the molders with data on the specific defects and where we are seeing them on the parts so they can make adjustments to their processes and/or modifications to the molds themselves to solve the problems. While the root cause resolution remains in improving the molds, we also have fine-tuned our prepping techniques and can increase film builds in problem areas that often can save and convert a mold with a defect into a saleable part. How are paint suppliers helping you solve these problems? Substantial work has been done by paint suppliers to develop primers that can fill or cover mold defects, with particular emphasis on pin holes. However, we havent seen a fillable primer product yet that can do what we are looking for to hide these flaws. No question: There is a definite need, as some defect issues are inherent to certain resins and processes and not likely to go away anytime soon. What surface preparations do you utilize? A clean, dry surface is essential for painting plastics. Almost all of the parts we paint are scuff-sanded to provide a mechanical bond for the coating. All parts then go through a five-stage wash that is very much like a car wash. The first stage is a rinse. Then, a heated chemical wash is followed by three rinse stages. The final rinse is done with virgin reverse osmosis water with a rinse aid to help the water sheet off the part. And, just like a car wash, the parts pass through air cannons that drive the water off the surface. The parts then go through a dry-off oven prior to going through a destaticizing air blow off that releases any statically attracted contaminants on the part before paint application. Extreme variations in surface energies within the various plastic parts we paint also can be influenced by the molding process itself. In general, the higher the surface energy, the more paintable the part will be. Paint suppliers will formulate solvents into the paint that can help etch the surface and improve adhesion. For resins with lower surface energies, we will apply an adhesion promoter and have even utilized flame treating when necessary to ensure good adhesion throughout the part. We recently built a self-contained spindle line in one of our plants that was designed for painting smaller parts. On that line, instead of a multi-stage water/chemical wash, we installed a carbon dioxide cleaning system. It utilizes liquid CO2 mixed with a propellant gas to form particles of various sizes and density that can be delivered at high pressures to clean the part without damaging the surface. There are advantages to this system: It occupies a smaller footprint than a traditional wash line, parts are completely dry after the cleaning, it doesnt generate any cleaning waste byproducts, and it requires less maintenance. It has worked well for us in specific applications. Have there been market changes  positive or negative  that youve had to react to as a painter? Because of government emissions regulations, some of our customers had to develop engines that operate at higher temperatures. The regulations required changing to resins that could withstand these higher temperatures without distorting for some of the parts we were painting. It can be more difficult to achieve a Class A appearance with these resins, but we have been able to work through these challenges with changes in our pre-paint preparations. Don Stankus is the operations manager for Plasti-Paint, Inc., a contract painting provider with three facilities in St. Louis, Michigan; DeWitt, Iowa; and Franklin, Georgia. Plasti-Paint specializes in advanced painting of plastic parts, as well as pretreated metals. Plasti-Paint services dozens of clients across a wide variety of industries, including automobile, agriculture and recreational vehicle. Plasti-Paints state-of-the-art facilities can accommodate parts for a variety of interior and exterior applications, including complex shapes, metallic and a full range of sizes. For more information, email dstankus@plastipaint.com or visit www.plastipaint.com.